Veitch says he was instructed to exclude major public transport projects from modelling, but that it wouldn’t affect the data as potential users of the EWL are not public transport users. 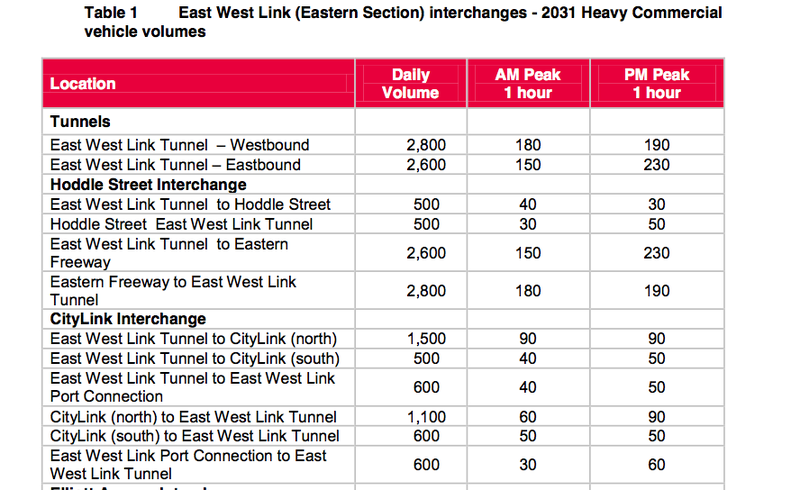 Heavy vehicle traffic in Footscray road and Arden St. has been modelled, but not published (as far as we know). Tables showing vehicles numbers on Hoddle St in AM and PM peak appear incorrect. Further information was requested. Moonee Valley representatives argued there is no consideration of points of congestion on Mt Alexander or Racecourse Rd. Veitch said the change to Mt Alexander Road by building EWL will not be great. Traffic in Mooltan St looks set to increase by as much as 30% – presumably by people exiting at Ormond Rd. No port connection would make CityLink worse, possibly considerably worse, said Veitch. He continued: the EWL is really important piece of infrastructure. One of the most important linkages in the network for Melbourne. Mr Pelosi gave evidence saying the EWL will boost efficiency of freight to the Port of Melbourne. Those listening felt it was curious that he referred to both parts A and B of the Link and the balance of the link to Western Ring Road (which is not part of the project) . More traffic experts will be in the hot-seat tomorrow. Keep your calculators handy. Today has been about the “black art” of predicting traffic on new roads. Veitch acknowledged the vexed nature of predictive modelling: “I can guarantee the model will be wrong”, he said, “but I would say there is a 90% chance we will be within 15% either side – I can’t be more precise than that”. A 15% margin of error – 90% of the time. Conveying the technical interrogation executed by Wren QC is difficult, but here are some key points that came out of the cross-examination of Veitch by Wren. 1. The benefits to Alexandra Pde will reduce over time and by 2031 there will be only 5% fewer vpd than 2011 (Table 25 page 83). 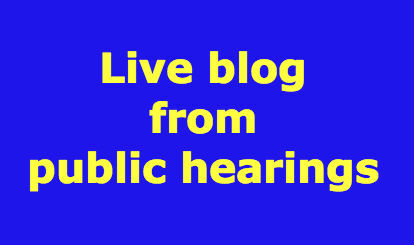 Wren commented: “This will not provide much benefit for Alexandra parade based on projected population figures will it?” Veitch’s answer: “It will on opening”. 3. The tunnel will be at capacity by 2031. Asked whether therefore should be wider tunnel built, Veitch said that this is not easy and this is not the way infrastructure is built. 4. Part B will have 1200 vehicles over two lanes in each direction in peak hour and 15,200 per day. These figures would provide very good levels of service. 5. And, the source of the data below was questioned by Wren. How does Veitch know the future travel plans of people living in these local streets? Veitch said it was an accumulation of data, but further details were not forthcoming. The figures below depict the origins of the 70,000 predicted extra vehicle on the eastern freeway. Wren QC has cross examined Veitch on the following tables and graphs asking about the derivation of figures. He asked about the level of service for 1200 vehicles on the Part B viaduct in the hour am peak. Veitch said it would be “pretty good”. There was uncertainty about the definition of ‘heavy’ commercial vehicles as opposed to ‘light’. Mr Veitch addressed issues raised by submitters against his report in the CIS. Rather significant;y, the 2031 figures in the CIS don’t take into account public transport upgrades. 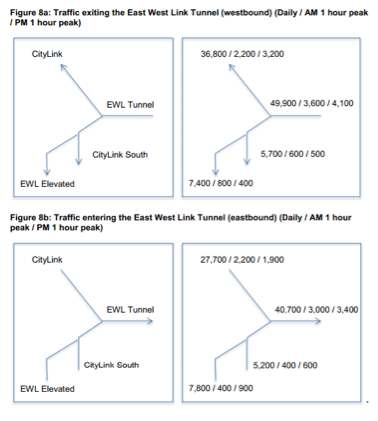 CIS traffic modelling does not include Melbourne Metro impact. Mr Veitch said that people from the EWL catchment are not users of public transport. He claims Eddington report statistics (which his firm did) are not inconsistent with his present report, but that validation methods have changed. “It is a bit of a black art,” he says. VicRoads historical travel figures are not at odds with his report, he argues, and his model does take this induced traffic demand into account. Rat running to avoid tolls: the road itself will cause a reduction in rat running (because more people will use it). Tolls will reduce the avoidance of rat running (with the amount of the toll being an influence in this). Variable tolls are proposed to handle demand management. Then there was something about whether people choose bananas or apples when they are cheaper. Clem 7 toll has been modelled extensively and has shown that demand is very sensitive to toll changes. Mr Veitch confirmed that a 50% higher toll would produce 40% less traffic. He was unable to say what toll level had been assumed in the traffic modelling. The Zenith model in the CIS does not assess whether more trips will be made because of an upgraded road. Veitch does not think significant numbers of people make more trips because of better roads. He says there is “nothing in our forecast that says we will suddenly create traffic out of nowhere that will use EWL”. In the use of “Investment grade modelling” the forecasting company take a risk. There is a greater level of responsibility in forecasting for private investors. Mr Wren QC highlighted a reference to “Option 158” and asked exactly how many options the LMA had examined. This line of questioning led to a concession that 20-30 route variations had been considered but not all had been fully traffic modelled. Mr Wren QC also sought a number of reports listed in the LMA material and a better map showing the changes in traffic flows. Mr Veitch’s speciality is traffic-forecasting and he is called as a witness by LMA. He has long experience in his field and claims a high level of accuracy for his forecasts. Michel Veitch has run through a presentation dealing with 12 major categories of objections made by community submitters. His claim to be the “most accurate traffic forecaster in Australia” was somewhat deflated by his later admission under cross examination by Chris Wren QC that he had not actually designed a road in his career. He admitted that traffic along the Alexandra Pde corridor was down by 4% pa over the last decade but attributed this to a redistribution of traffic onto the Monash freeway and the Ring Road. He agreed that traffic in Moonee Valley would increase dramatically but said that in any freeway project there were “winners and losers”. The cross examination has now started and will run most of the day. The day started with the Assessment Committee making rulings that it would “wait and see” about whether the LMA was permitted to bring in material outside the CIS, what weight to give Stephen Pelosi’s evidence and how to appraise the SGS report in the absence of evidence from Mr Spiller who the LMA have withdrawn as an expert witness. The assessment committee reported that all documents will be uploaded onto the website but that it will take one to two days. There was a preliminary submission by Andrew Herington in relation to attempts by LMA to limit the scope of matters which can be considered by the commitee. This was taken on notice. There was a preliminary matter raised by Gordon Ley as to the particularly misleading statement in the LMA submission yesterday to the effect that only one section of the Royal Park would be impacted and that less than one per cent of the Park would be affected.